Back in January I outlined a few books I wanted to read this year because I wanted to parent more intentionally . By seeking out information as I would for anything I’m learning. As usual I’ve been sidetracked and have read lots of others things but I will get back to my list. Since I read a lot of books for pure pleasure and escapism and the non fiction usually has an immediate purpose or need. I was happy to see a book that was written to inspire me. First of all, I love books written by teachers. I feel like I’m in the classroom with them and so much of what they write I feel empathy towards. Rafe is an elementary school teacher. I have a son that is in elementary school. Also I felt that whatever he had to say could relate to the rest of the family. I wasn’t wrong. The book was split up into innings. The game metaphor goes throughout the book which for me was tough going as I am not into this particular sport. However, it didn’t spoil the reading of the book and I got the gist of what was being said even if I didn’t quite understand the play by play. 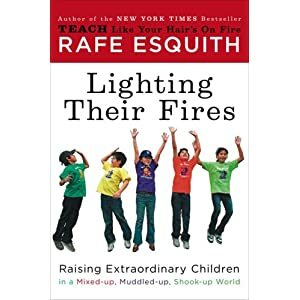 Rafe has a easy reading style that mixes common sense parenting with real examples and ideas of how he’s seen it work. As with all inspirational work. There was a lot of head nodding with agreement and “Yep. Done that.” But the difference in this book wasn’t that he was trying to teach some secret formula to happiness but instead, I feel, he was reminding us the secret is in what we give to our children. The gifts of things that can’t be bought but nevertheless need to be taught or is that caught. The typical layout of the book is a story about the game the students are watching or what happens while they are in the stadium. He points out some elements of the story and how he would deal with it to illustrate his point. The final section of the chapter are ways that we as parents can work on these points with our children. Using weekends to teach time management. Punctuality and its ramifications in life. Throughout the book , Rafe illustrates his points with movie and book titles and examples to direct you towards making this happen in your family. He does make it look easy but he’s had plenty of time to develop this style. However the points hit home and the ideas are possible. He’s not an extremist but does have some firm views on television, reading, Shakespeare and a few other things that may surprise. Fortunately these are ideas not a method that you must follow to the letter so it’s easy to dip and choose what will work well for your family without feeling that you’ve taken all the fun things out of life. He offers lots of fun ideas but they do require a willingness to change your world view. As with all inspirational books or how to books. If you’re reading it is because you need it, usually, and where you’re at now and where the book is leading maybe poles apart and seem unrealistic or even unobtainable. However, this book mustn’t be overlooked because of it’s commonsense notions. The story give you a chance to substitute your family and see how it would work for you. Slow implementation is one thing I got from this book as well as be intentional about what you want your children to be. The opportunities they have later are reduced by the choices we give them now. That’s not always about money. There are plenty of things we can work on with our children that have nothing to do with money. I read the hardback version and with 195 pages is a quick read. I read small sections at a time and took my time with the book making notes and really thinking about how I would apply this to my family. It would have made a good non fiction book club book to share with other parents. Especially for the opportunity to share resources and experiences. This is what I enjoyed the most about this book was talking to others, mostly my husband. It gave us a chance to put into words what we thought we both knew about raising our children. Namely that we want them to be “..extraordinary in a mixed up muddled up shook up world” and the way to do this is have a plan, a path, and a direction that we both agree on- said out loud. I’ve read before some book and movie reviews and people are disappointed if they are not wowed by the entire book. I guess I’m easily satisfied because I’m happier to have a few take away points from the books I read. This book wasn’t an electrifying read. I did learn a lot of things and it made self reflective and talk more. He talks a walk I’m familiar with so there were a lot of head bobbing moments. I’m all for having more ideas and examples up my sleeve. Raising children……… I’ll take everything I can get. It’s a book I would recommend to parents anytime up to before their children go to elementary school. It gives you a school overview and perspective namely that parents and teachers must work in partnership and not us and them. If that is a radical concept then this book will knock your socks off. For those almost there or there then this book will show you concrete ways to inspire your children to be less mediocre and more extraordinary. Extraordinary in an age appropriate way.